Home / Announcements / Missed Any of the Great Visiting Artists this Semester? — Visit iTunes U! Missed Any of the Great Visiting Artists this Semester? — Visit iTunes U! Did you miss any of the amazing Visiting Artist Lectures this past semester (or the one prior for that matter!)? Well, fear no more, you haven’t missed out… Thanks to the assistance of wonderful work-aids (Morehshin & Kate! ), you can catch full-length footage of these talks on the Interdisciplinary Arts iTunes U channel. 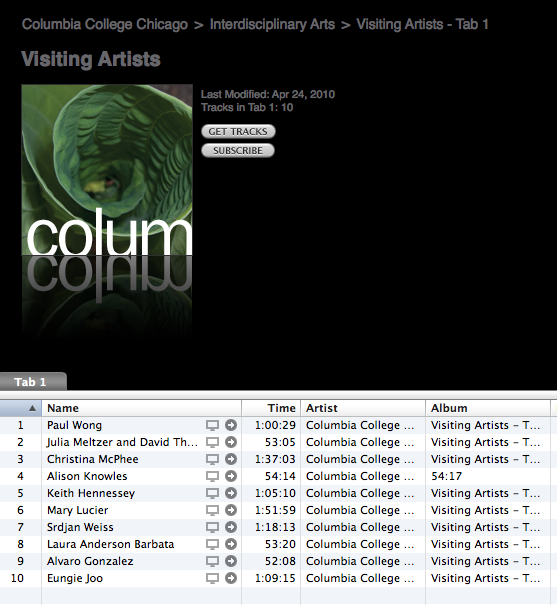 You must have a Columbia College oasis ID and password to login, and iTunes software loaded on your computer, but once you’re in, just scroll down to the School of Media Arts, click on Interdisciplinary Arts, and there you will find the Visiting Artists link! Also coming soon, full-length footage of this year’s Thesis Performances… keep an eye out for that announcement in the next few weeks! Previous Article Don’t Miss the Live Readings of Theisis Work: THIS Friday!